Cancer is one of the principal leading causes of death worldwide, and thus it is one of the most studied diseases. Nuclear imaging modalities (positron emission tomography (PET) and single photon emission computed tomography (SPECT)) combined with computed tomography (CT) or magnetic resonance imaging (MRI) are the most commonly used techniques to retrieve non-invasively anatomical and functional information of tumors. 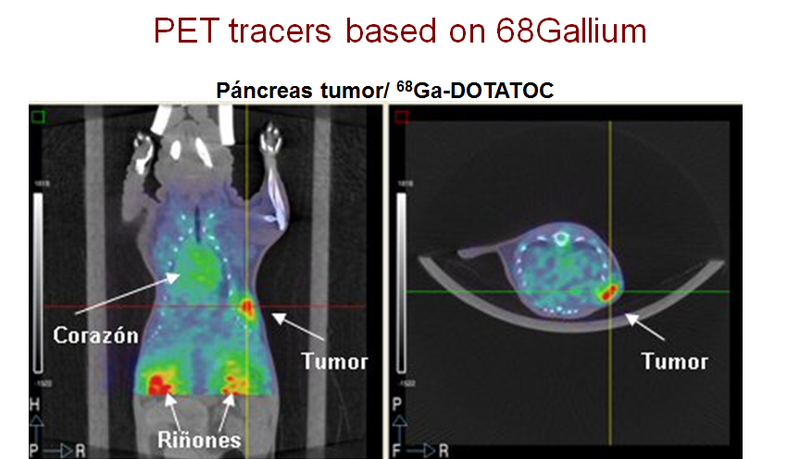 Besides standard 18FDG-PET/CT studies our group is specifically working on two main lines: novel tumor tracers such as somastotatin analogues; and to noninvasive methods for cell tracking towards tumors on animal models. Meningiomas arise from the meningothelial cells of the arachnoid membranes, which are attached to the inner layer of the dura mater. They are usually diagnosed using morphologic imaging methods such as CT and MRI. However, meningiomas located near the base of the skull may be difficult to distinguish from other lesions, such as lymphomas, metastases, or neurinomas. 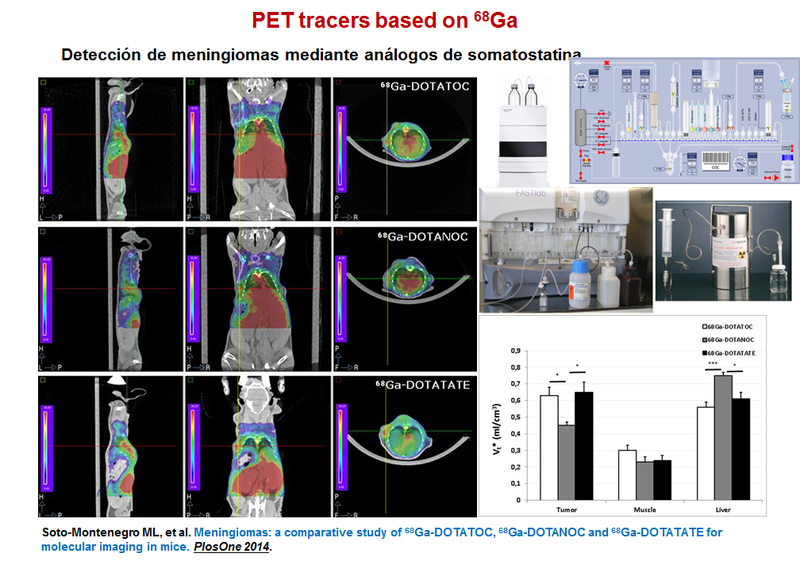 Taking into account that meningiomas express a large variety of receptors including somatostatin receptors that can be visualized in vivo by targeted PET tracers, we have evaluated the ability of three radiolabeled somatostatin analogues (68Ga-DOTATOC, 68Ga-DOTANOC and 68Ga-DOTATATE) to image a human meningioma cell line. Homing is an inherent, complex, multistep process performed by cells such as human bone marrow mesenchymal stem cells (hMSCs) to travel from a distant location to inflamed or damaged tissue, and tumors. This ability of hMSCs has been exploited as a tumor-targeting strategy in cell-based cancer therapy. Migration of hMSCs can be tracked using molecular imaging modalities. Besides genetic modification, hMSCs can be labeled with different radiotracers (99mTc-HMPAO, 111In-oxine, and 18F-FDG), (ultrasmall) superparamagnetic iron oxide ((U) SPIO) particles, and quantum dots. 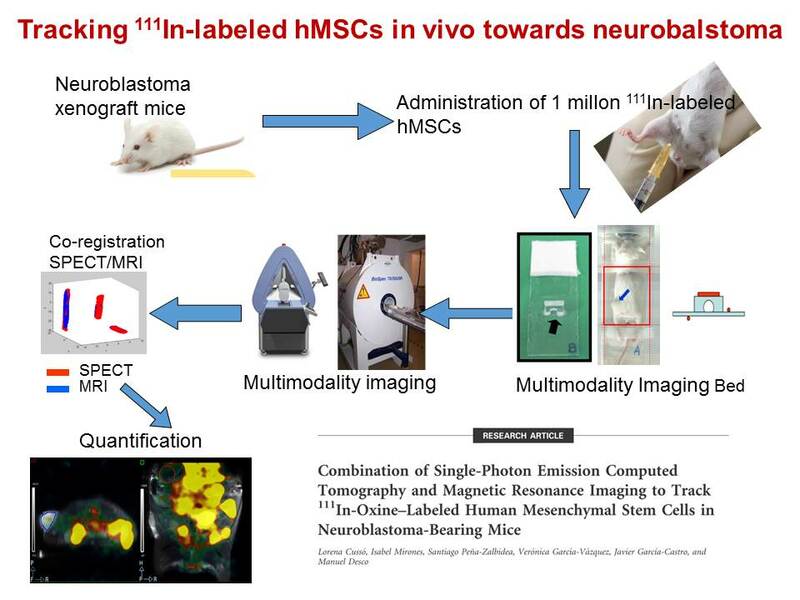 The use of the corresponding imaging modality provides noninvasive methods for tracking and quantifying the fate of hMSCs administered in vivo, although not all available procedures are applicable to humans. Although many strategies are able to label and track stem cells in vivo, only 111In-oxine and 99mTc-HMPAO are currently approved as clinical procedures (indicated for the detection of infections and inflammation by labeling leukocytes). SPECT and MRI combination allowed us to demonstrate that 111In-labeled hMSCs can home to neuroblastoma within 24-48 hours of intraperitoneal administration. Although our procedure was only tested with SPECT/MRI, it can be easily applied to other non-hybrid imaging modality combinations such as SPECT+CT or PET+MRI. Although the importance of FDG in the clinical routine remains unquestionable, there are well-known detectability problems in several applications due to its non-specific tissue uptake. In the case of reducing non-specific heart uptake, several preparatory protocols (such as diets and drugs) had previously been tested, but we performed the first comparative evaluation of these strategies. 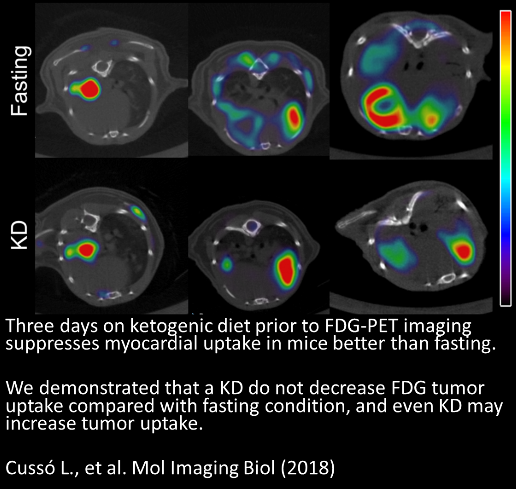 We developed a simple and effective protocol that used the ability of the myocardium to switch its metabolism from glucose to FFAs in order to reduce myocardial FDG uptake, thus improving lung tumor visualization. J Urosevic, V Sauzeau, ML Soto-Montenegro, S Reig, M Desco, E Burkitt Wright, M Cañamero, F Mulero, S Ortega, XR Bustelo and M Barbacid. Constitutive activation of B-Raf in the mouse germ line: A model for human cardio-facio-cutaneous syndrome. Proceedings of the National Academy of Sciences of the United States of America (PNAS) 2011, Mar 22; 108(12):5015-20. IF = 9.737. ML Soto-Montenegro, S. Peña-Zalbidea, JM Mateos-Pérez, M Oteo, E Romero, MA Morcillo, M Desco. Meningiomas: a comparative study of 68Ga-DOTATOC, 68Ga-DOTANOC, and 68Ga-DOTATATE for molecular imaging in mice. PLOsOne 2014 Nov 4;9(11):e111624. IF = 3.534. JM Mateos-Pérez, ML Soto-Montenegro, S Bacharach, M Desco, JJ Vaquero. Automatic functional segmentation of dynamic PET studies: a leader-follower-based algorithm open implementation and validation. Computers in Biology and Medicine (en revision). 1. Imagen molecular mediante PET/CT de meningiomas con péptidos marcados con Ga-68 en un modelo murino. PI11/00616. Ministerio de Ciencia e Innovación.2012-14.